The new Pope = End of the Church? The first vote for the new pope is just being counted. According to our source, Milan Cardinal Scolia (our choice) has taken a strong lead. In its present sorry condition, only an Italian Pope would have the ability to clean up the Catholic Church. Only a man like Cardinal Scola can end the sexual excesses of the leading Vatican prelates in Rome. There was no way that the last Pope, Pope Benedict XVI, could do the job. Especially after it was discovered that he was flying around in the Papal airplane with women—one of the discoveries that led to his resignation—a proven fact, available in the Internet. The next Pope—Angelo Scola, the archbishop of Milan. You heard it here, and we heard it from our source in the conclave. According to two ancient predictions one by St. Malachy, the other by Nostradamus, this next pope will be the last. That theory dates back more than 900 years to when St. Malachy, the 12th century Archbishop of Ireland, had a vision on a trip to Rome. St. Malachy “saw” all the names of the future popes–complete with identifying characteristics–who would rule the church until the end of the Papacy. St. Malachy’s “Prophecy of the Popes,” named Benedict XVI as the 111th–and next-to-last – pope. St. Malachy’s vision ended with the 112th pope. The 20th century pope during World War II, Pius X, was convinced that Malachy’s vision was indeed divine. The first pope on St. Malachy’s list would be “from a castle on the Tiber.” This was clearly a spot-on prediction for Pope Celestine II who was born on the bank of the Tiber River. Ominously, in St. Malachy’s vision, the last pope–who will soon be elected–is described as, “in extreme persecution, the seat of the Holy Roman Church will be occupied by an Italian Pope. Nostradamus, the 16th century French astrologer, predicted almost exactly the same as did St. Malachy. 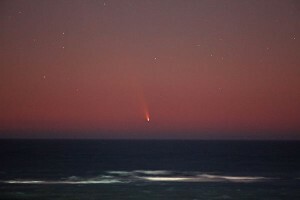 True to this prediction, an obscure, comet known as C/2011 L4 (Pan-STARRS), is starting to light up the skies and be visible from earth during the papal conclave. 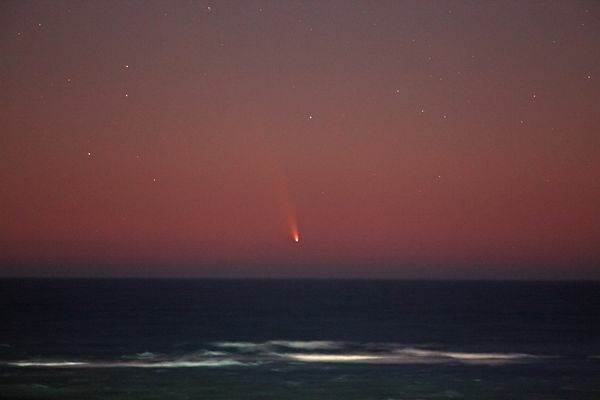 Observers around the world can now catch a glimpse of comet PanSTARRS and the barely lit crescent moon, as long as there are clear skies. Brightening a million fold since its discovery only in June 2011, the comet has already become easily visible by the naked eye from the Southern Hemisphere with its enormous 40,000-mile tail. Also, taking into account that the calendar months were different hundreds of years ago, Nostradamus was spot on as Benedict XVI abdicated and fled from Rome to the nearby refuge for Popes, Castel Gandolfo. 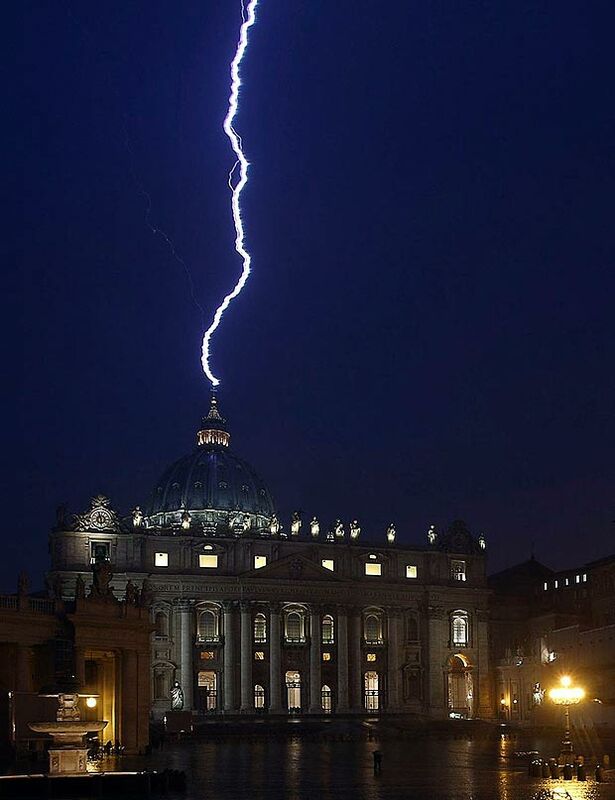 Just hours after Benedict XVI abdicated, a bolt of lightning struck the very top of St. Peter’s Basilica, the very heart of Christianity. A few days later, a huge meteor crashed into Russia. For the astrologists, it is significant that, during Saturn’s retrograde in Scorpio, we will have the rise of the next and final pope of the Roman Catholic Church. The next pope will be the one to end the Church. Both St. Malachy and Nostradamus are in full agreement with this—dates, comets, names and all! So we were wrong. Cardinal Jorge Mario Bergoglio of Buenos Aires, son of a railway worker, was named leader of the world’s 1.2 billion Catholics and will be known as Pope Francis I. He is a Jesuit, and speaks perfect Italian. In Argentina, he moved from his impressive Cardinal’s mansion to live in a small apartment. Pope Francis I speaks perfect Italian with no accent, so he should be accepted in Italian, even though the Italians were rooting for Angelo Scola, Archbishop of Milan. What is most surprising is that Francis I is a Jesuit. The Jesuits are know for brilliant and controversial priests. On 15 August 1534, St. Ignatius of Loyola , a Spaniard of Basque origin, and six other students started the Jesuit movement. In 1537, Ignatius of Loyola traveled to Italy to seek papal approval for his order. Pope Paul III gave them a commendation, and permitted them to be ordained priests. This led to the founding of the Society of Jesus later in 1540. Today, Jesuit priests are in the minority. The Jesuits specialize in educational, missionary, and charitable works, and have been the leading force in modernizing the church. So, maybe St. Malachy and Nostradamus were correct that this will be the last pope, in the sense that Francis I will “rebuild” the Catholic Church. St. Francis, from whom Francis I took his name, had vision of a talking crucifix in an abandoned chapel: “Francis, rebuild my church.” By taking the name of Francis I, the current pope may well transform the Catholic Church as we know it. Like St. Francis before him Francis I may set out to rebuild the church. 3 comments to The new Pope = End of the Church? Pope Francis is a superb choice! He was not wearing the red cape and the red shoes that the previous pope was doing. I, too, had anticipated Cardinal Scola, from Milan as well,. However, I am very pleased to see a new Pope, as humble, kind, as Pope Francis is. There will be millions of people from Latin America, coming forth to the catholic church. There was a decline in the Usa, of catholics, but all this will change with Pope Francis. thank you! The Vatican is brilliant with the selection of Pope Francis!